The Vanderbilt Residences at Brown & Howard Wharf enjoy a superb waterfront location right in the heart Newport's historic waterfront district. The 16 luxury properties offer active harbor views, fine quality craftsmanship, state-of-the-art appliances, covered parking, luxurious floor plans and a private marina just outside the door. Walk to Newport's excellent restaurants or one-of-a-kind shops, or venture onto the water where you may find yourself alongside classic 12-meters, Tall Ships or high-tech America's Cup catamarans. You won't find better sailing anywhere in the US, and the spectacle of this active waterway will take your breath away! 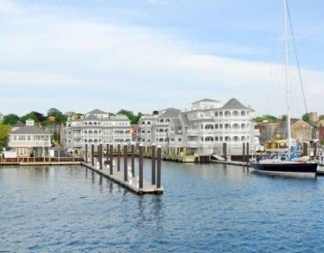 View luxury waterfront condos for sale, or read more about other desirable Newport communities. Discover the Residences at Brown & Howard Wharf condos and you'll quickly find it's one of the best area to live in Newport. Its location right on the harbor means you are in the middle of the fun by the docks. The Marina at Brown & Howard Wharf is right there if you want to tie up outside your residence. Docks onsite can accomodate vessels up to 250 feet. Truly distinguished among residences, the service at Brown & Howard is beyond exceptional. The concierge is available to stock your pantry and get your home spruced up for your arrival. As well owners have access to an on-site property manager who can check up on the home while you're away. If you have any questions about buying or selling a unit from the Brown & Howard Residences, please contact Hogan Associates or call 401.845.9500. If you're looking for waterfront luxury in Newport, RI call us at 401-680-6588 to learn more about the Residences at Brown & Howard.